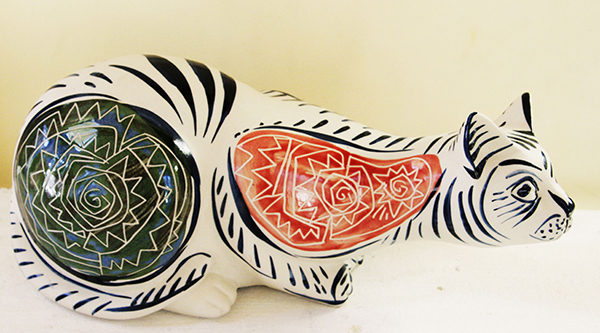 Day 7 - Win a stunning handmade pottery cat from The Cat Gallery! Today, The Cat Gallery is offering the chance to win a stunning pottery cat, handmade and painted by a small family run group of craftspeople in Northern Spain. The hunting pose gives real life to the piece, and the decoration has Picasso influences. If you’re not lucky enough to win this one, they have a few more available on their website. The Cat Gallery has been offering unique feline themed gifts to cat lovers worldwide for over 17 years. Why not check out their website? While you’re there, don’t forget to sign up for their e-mail newsletter – it’s the way they tell customers about sales and special offers. Shop: 45 Low Petergate, York, YO1 7HT. For your chance to win, login or create an account to answer the simple question on this page. This competition closes at MIDNIGHT tonight (December 7, 2018) and is for UK residents only. Good luck! PLEASE NOTE: Due to the busy festive period, please allow up to 28 days to receive your prize - we cannot guarantee delivery before Christmas. The cat featured on today's advent window is Lenny, sent in by Karen Provan.